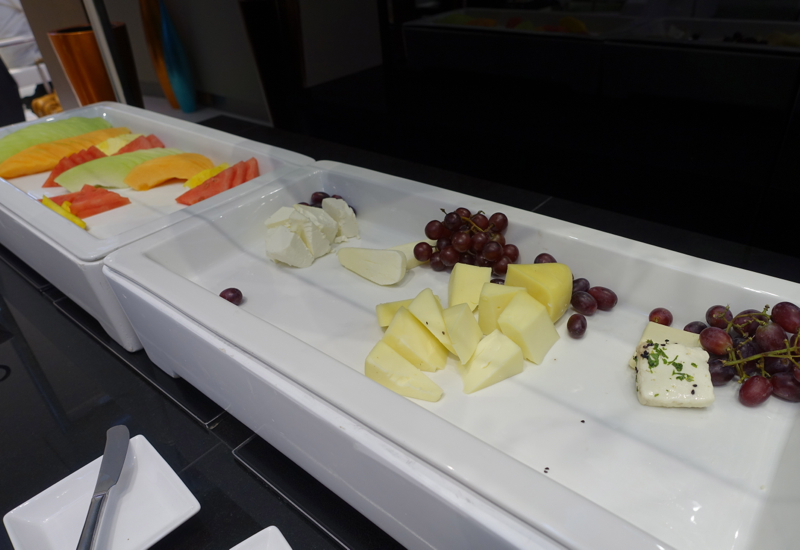 This Review of Etihad's Lounge at Washington Dulles Airport (IAD) is part of a trip report including Etihad First Class to Abu Dhabi and luxury resort stays in Abu Dhabi and Southeast Asia. 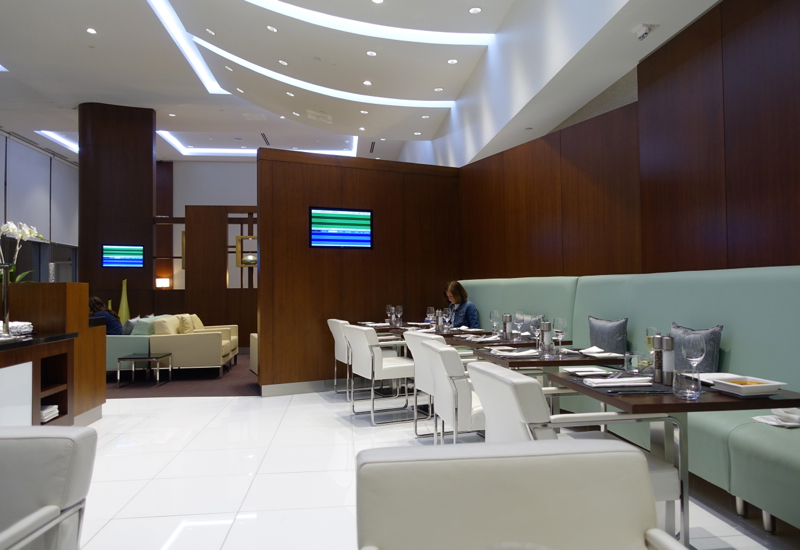 Etihad's Lounge at Washington Dulles Airport is located in Terminal A. After clearing security, you'll need to take the inter-terminal train one stop to Terminal A. The lounge opened in 2013 and as you enter Terminal A from the train is on the left. 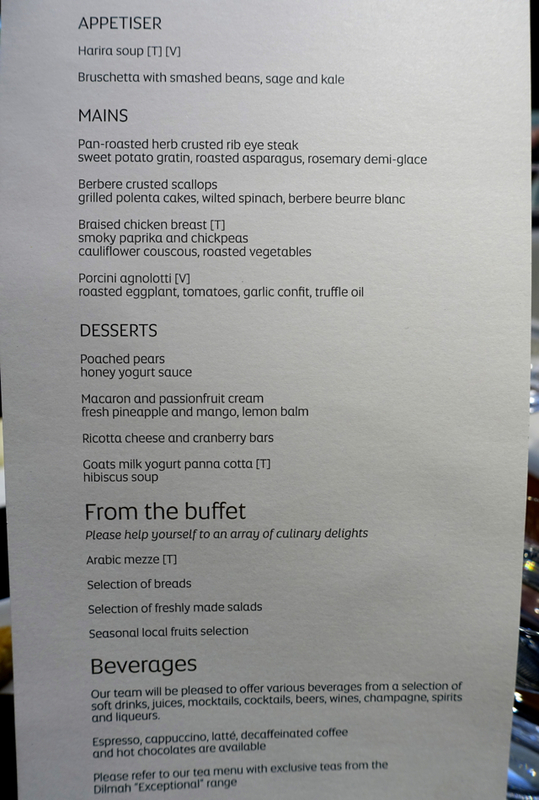 Access is open to Etihad Business Class and Etihad First Class passengers. After presenting our printed out boarding passes and passports, the reception staff stored our wheeled luggage and escorted us to the dining room area of the lounge. The lounge features several seating areas, dining room with a light buffet and a la carte menu dining, free WiFi, separate men's and women's shower suites, and a kids' playroom. On the left was another seating area. Beyond, you can see an Etihad staff member ready to check tickets prior to flight boarding. 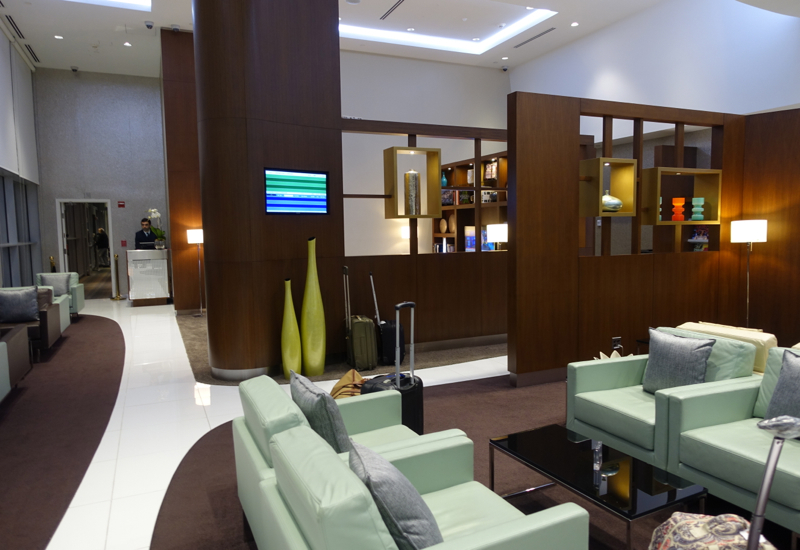 It's a convenient and appreciated feature to be able to board directly from the lounge, since it's right near the A gates Etihad uses for its flights. Our gate was A14. 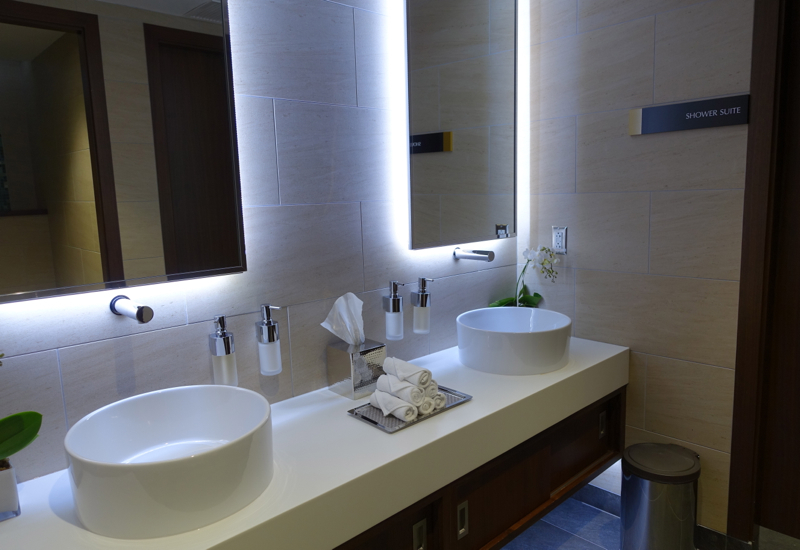 The women's bathroom was immaculately clean, with dual sinks and even the hand towels in a neat pyramid. 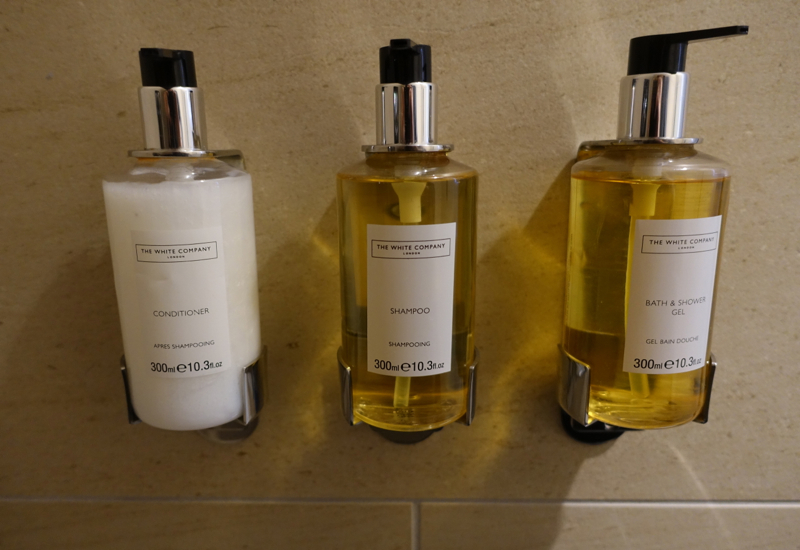 Bath products were by the White Company. The dining room offers about 10 tables, and while we dined there were only two other passengers dining, so it was a pleasant and relaxed experience. 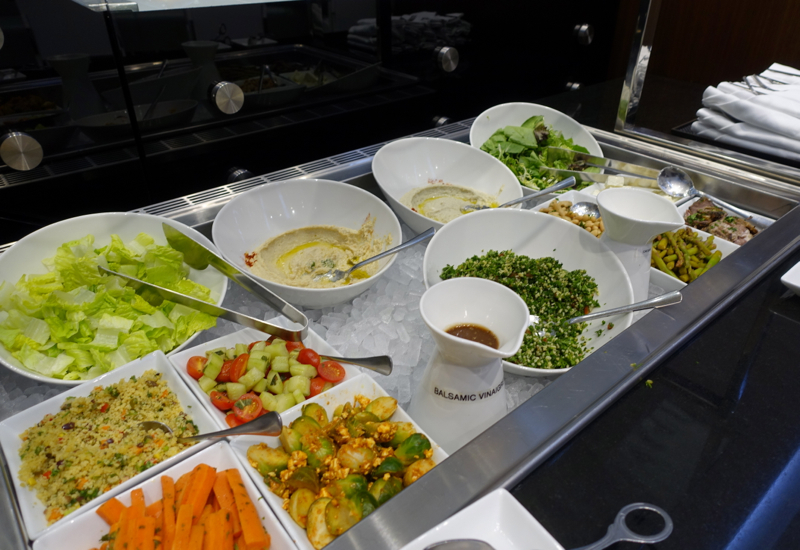 A help yourself buffet included Arabic mezze, such as hummus, baba ganoush, a tabouli-like salad, other vegetables, pita bread, an array of cut fruits and cheeses. And I started with a taste of the dips and tabouli salad. 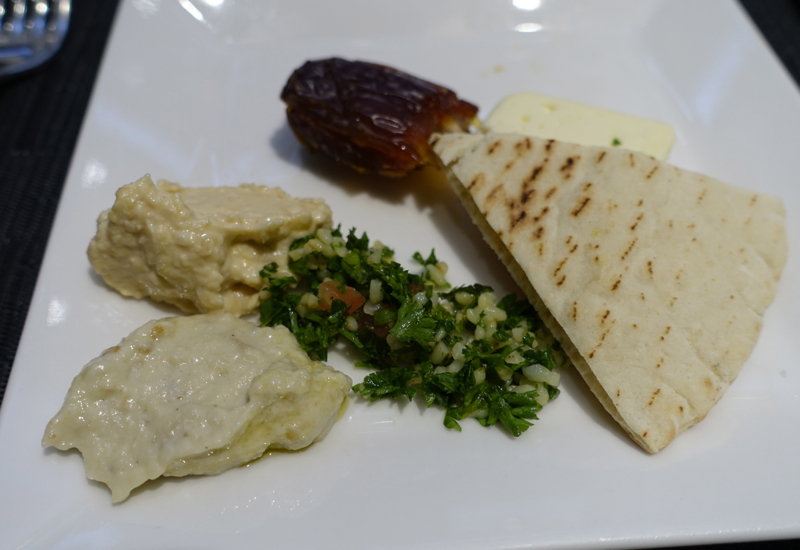 I especially enjoyed the baba ganoush, with its hint of smokiness. I started off with harira soup. This version emphasized tomatoes over lentils. 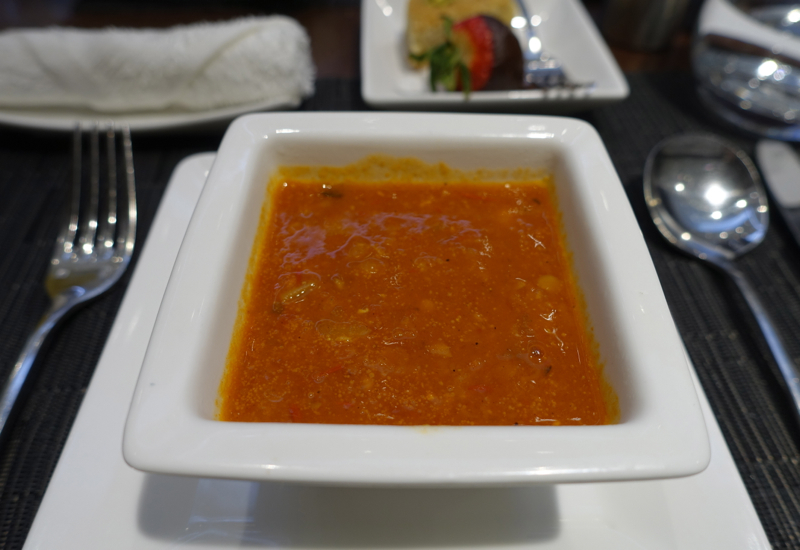 It was good, and the spicing was on point, but I've had better harira at Moroccan restaurants, and of course in Marrakech at the Four Seasons Marrakech. Our mains took awhile, which my son complained about because it was past his bedtime and he was tired. 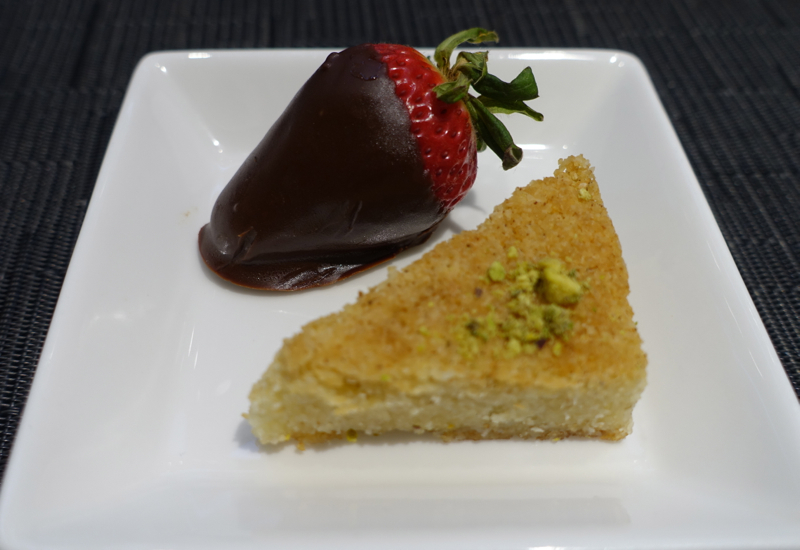 Since it took awhile, I let him have some of a chocolate covered strawberry and Arabic pastry we'd taken from the buffet. He was a happy camper after they arrived, however, and I barely managed to get a bite of his steak before he polished it all off. 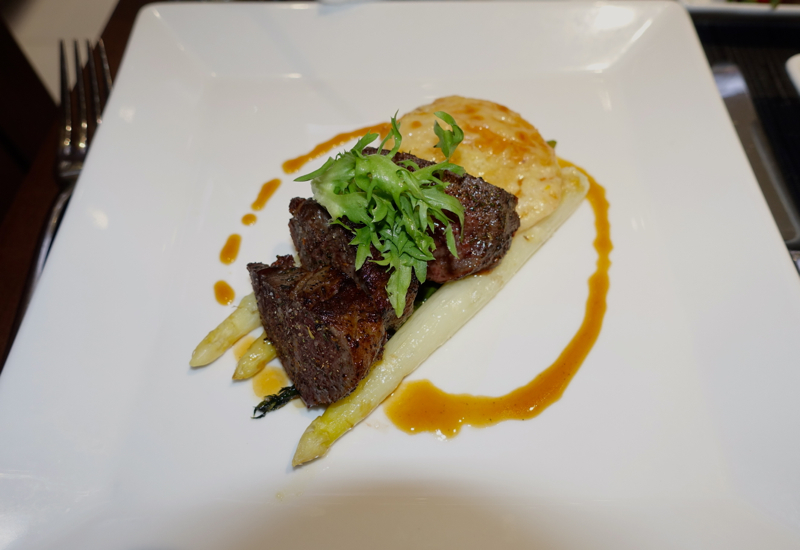 I thought it was fine–tasty and reasonably tender since it was rib eye and not filet mignon, although I'm not a steak aficionado. I also thought the side of sweet potato gratin was excellent. 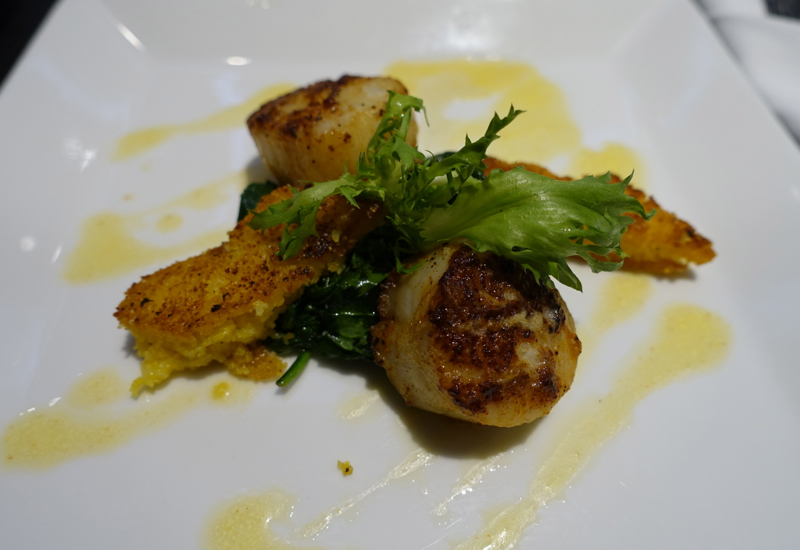 I very much enjoyed the Berbere crusted scallops, which were very fresh diver scallops and had a nice kick from the chili in the fragrant Berbere spice mix, which was redolent of coriander, garlic, and cardamom, among other spices. The grilled polenta cakes were an inspired complement, with wilted spinach rounding out the dish. For desserts, we tried three of the four. We originally ordered the Goats milk yogurt panna cotta with hibiscus sauce and the Macaron with fresh pineapple and mango. The yogurt panna cotta was recommended by our server, so even though I'm not a panna cotta fan, we gave it a try. It was beautifully plated, but in my view looked better than it tasted. 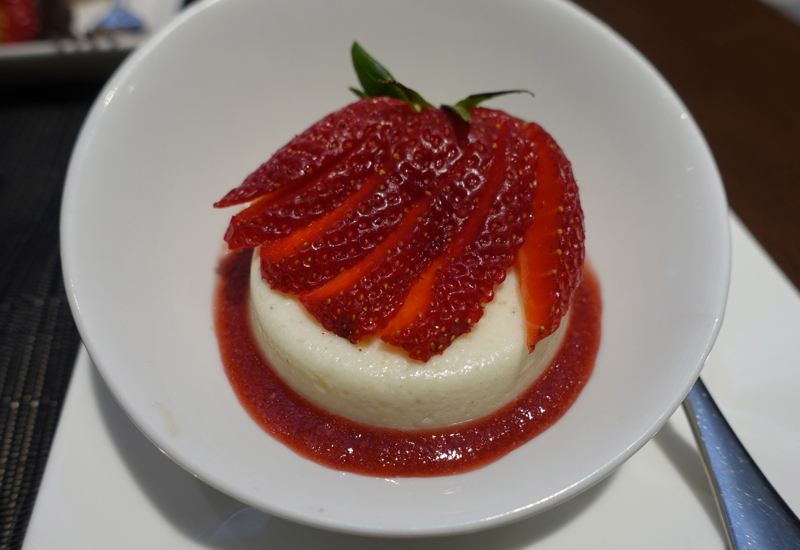 I would have preferred a slightly creamier panna cotta, as this one was a bit firm and gelatinous. The flavor was subtle, and I wouldn't have known it was made with goats milk yogurt. 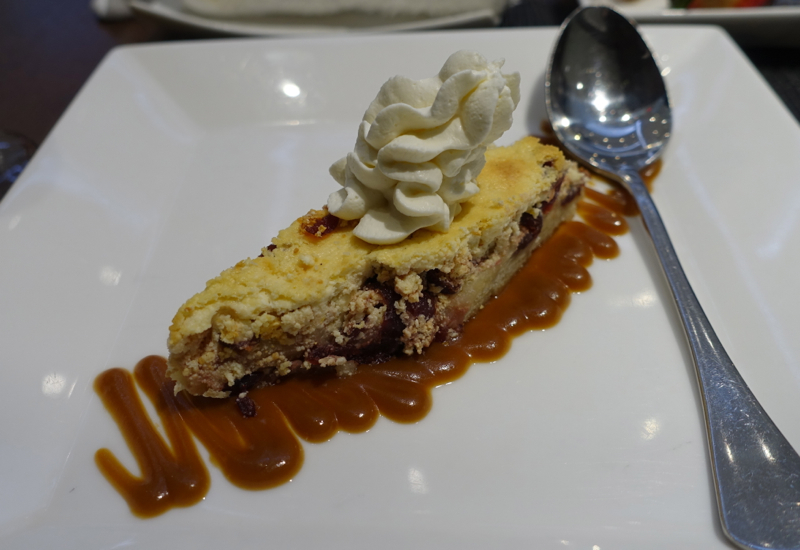 Initially, instead of the macaron with fresh pineapple and mango, we were given the ricotta cheese and cranberry bar. 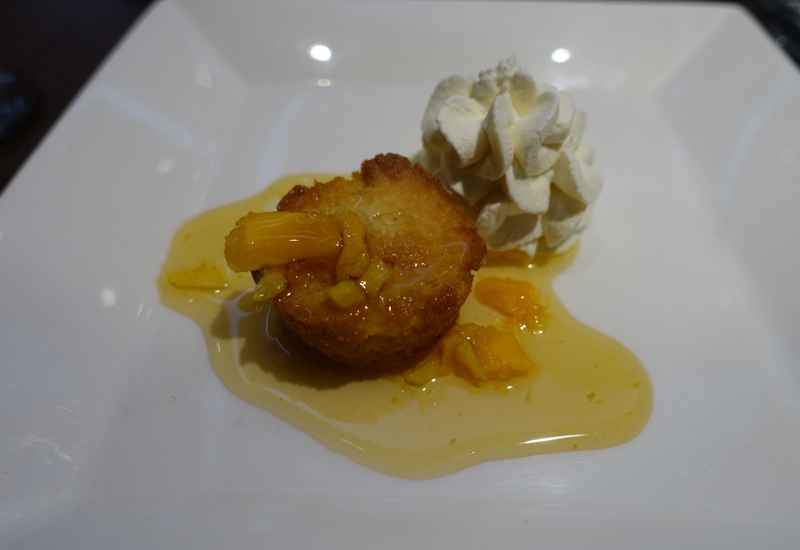 This was actually my favorite dessert of the three, even though it came in error. Our server was surprised when it emerged that the kitchen had mixed up the dessert order, and promised to get us the macaron right away. Interestingly, it wasn't a macaron at all, at least not a French style macaron. Instead it was a rather dry little cake, and the least appealing of the three desserts. 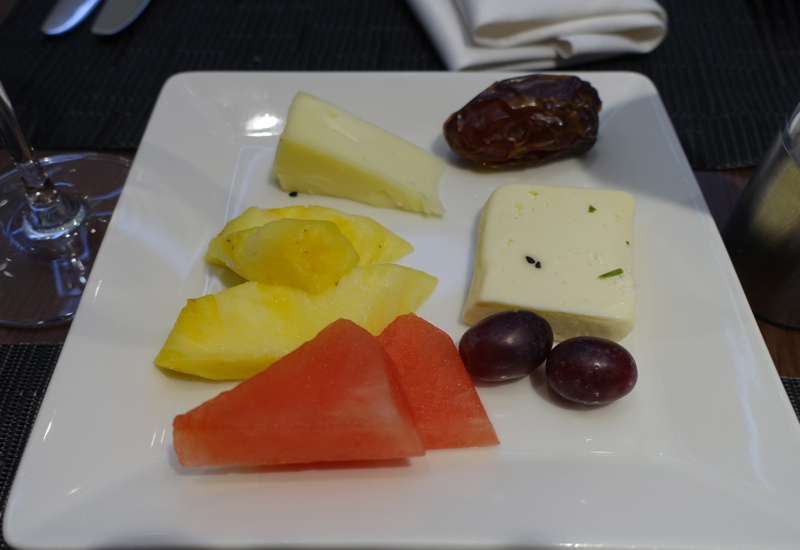 I actually enjoyed my experience in Etihad's Washington Dulles Lounge more than at Etihad's First Class Lounge in Abu Dhabi, since it was less crowded and the food was better. The Etihad First Class Lounge in Abu Dhabi does have a Six Senses Spa where I received the best airline lounge massage ever, apart from the 1 hour massage at the Thai Airways Royal Orchid Spa in Bangkok. 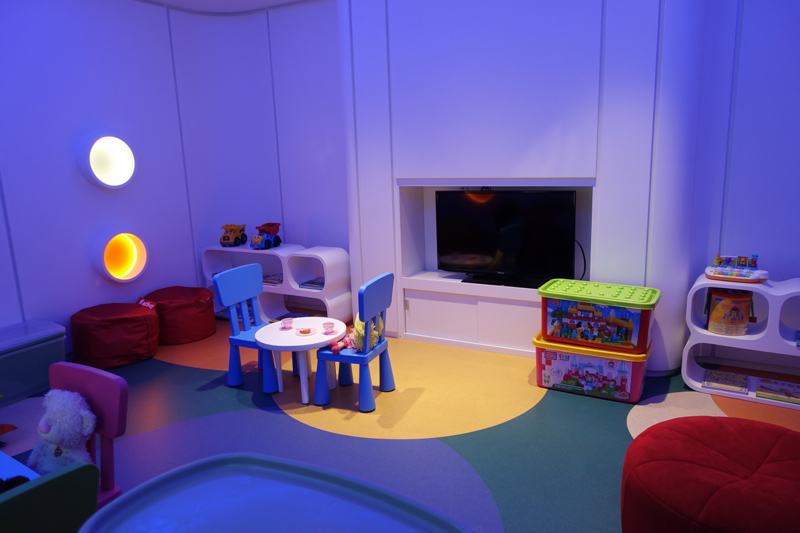 The staff were friendly, including to my 7 year old, which is always appreciated in lounges and first or business class flights when there are few other children around. 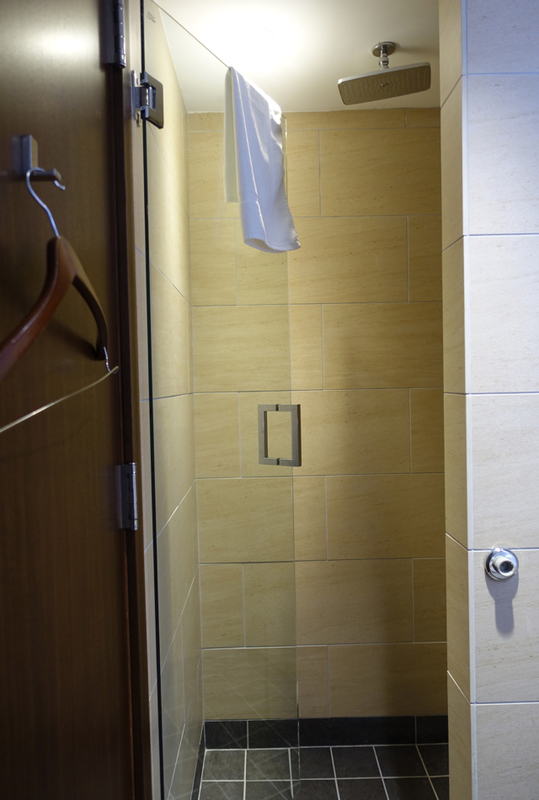 And while I didn't need a shower, I was happy to see a well appointed shower suite. There's only one, but I don't believe any other women used it during my visit to the lounge, though it's possible the men's shower suite is busier as there were more male passengers in the lounge. 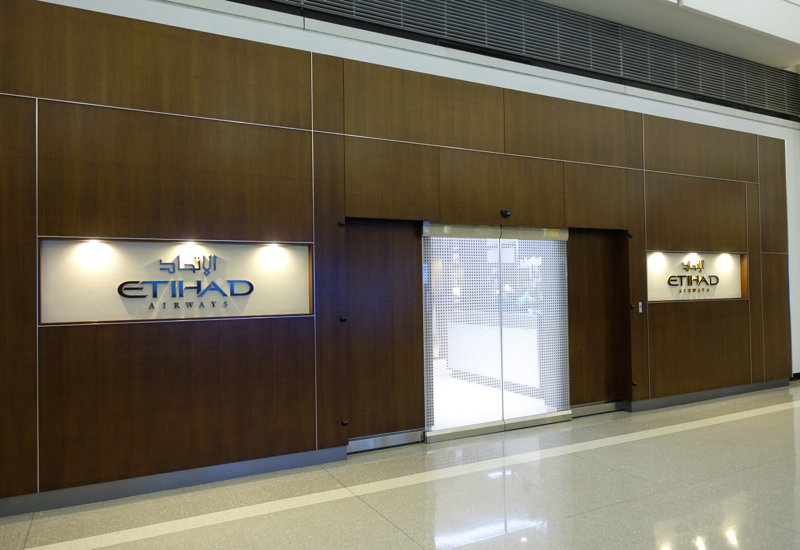 I especially love that the lounge is right near Etihad's gates and allows you to have your ticket checked right in the lounge before proceeding to the jetway. One of the things I hate about other lounges is having to leave them so early and trek to the gate and wait around there before boarding–not at this lounge, where even though boarding commences 1 hour prior to departure, you're not rushed out, and can take your time finishing a pre-flight dinner or drink before boarding. 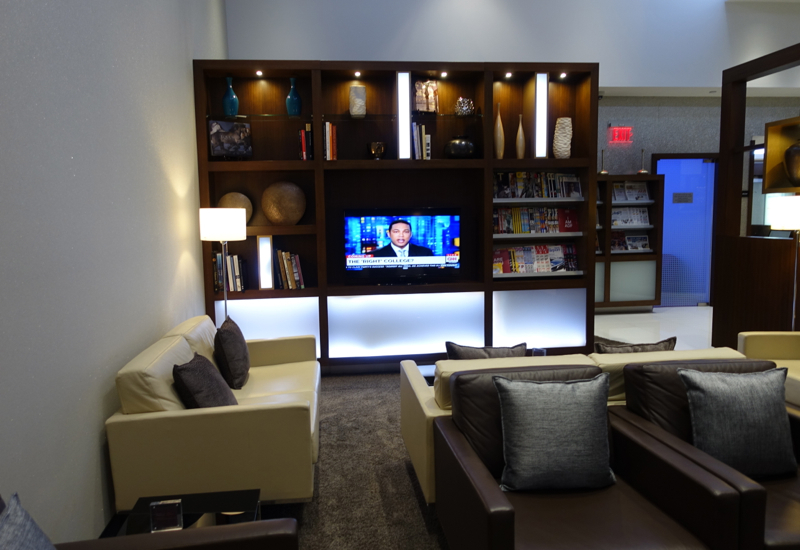 If you've visited Etihad's Lounge in Washington Dulles, what was your experience?